Click to download the basic invitation. Garden parties can be festive outdoor affairs during the spring or summer seasons. Graduations, bridal showers, or even birthday parties can all carry a garden party theme. The invitations you send out let invited guests know that you're throwing a garden party so you set the tone for the event right away. 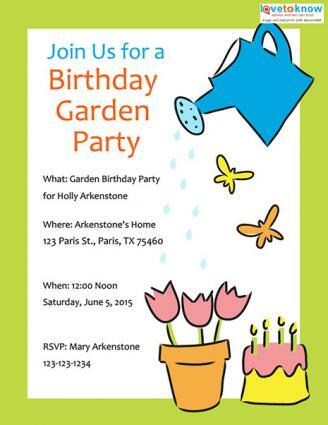 Follow Adobe instructions to download and personalize these party invitations and then print them on to card stock from your home computer. Nothing says garden party like a watering can, butterflies, and a pot of tulips. Along with a birthday cake, you can find these garden symbols inside of a light green border on the birthday invitation. Fill in the details for the what, when, where, and RSVP information, and you are ready to print and send. Click to download the birthday invite. A light blue border representing the sky runs around three side of this invitation to help celebrate the graduate. Bees and dragonflies flutter in that border. Green grass runs along the bottom, and a patio table with an umbrella and set with a teapot and teacups complete the invitation. Add the who, what, when, and where sections of the invitation and you're ready to print and send. Click to download the graduation invite. Garden invitation cards come in all shapes and sizes. You want your invitation to reflect the theme and mood of the party you plan to have. If the event is an afternoon tea for women, a floral design can be appropriate. A drawing or picture of a teacup or pot can also be a nice touch. 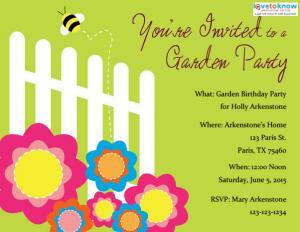 If the theme revolves around the host's love for bees, search for invitations that feature bees as part of the design. You can opt to write your own verse, whether you make the invitations yourself or buy them. You have a few different directions you can take your verses for a garden party. No matter what the actual wording is, it should be clear that the party is taking place outdoors so guests can prepare with bug repellant, handheld fans, bottles of water, and by dressing in loose and cool clothing. Start with a quote about gardening. 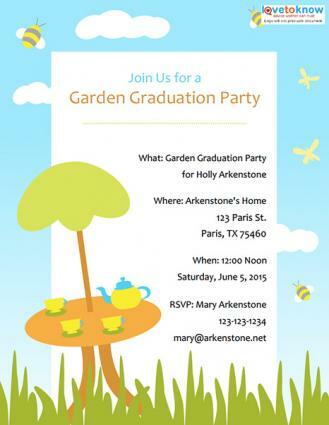 Come join us for a garden party to celebrate Jane before she runs off and marries Mark. Poets talk about nature, gardens, and flowers, so it can be easy to pull bits and pieces from a poem to kick off your invitation verse. On the party guests milling around. Which, by the gardener, has recently been shorn. to celebrate the day that Dana was born. Think of gardening terms you can weave into your verse. We're celebrating spring, so come out to our fling. 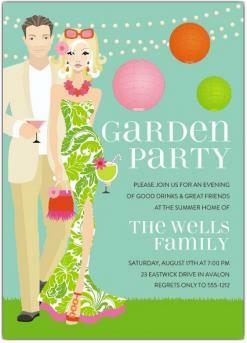 You can typically find a selection of garden party invitations at your local party store. The Internet is also a good source for finding the right invitation. Crane and Company: You can find simple floral designs and plant designs on Crane and Company. These invitations carry a simply stated, classic look. Color options range from multi-colored invitations to greens and hot pink. Invitation Box: Invitation Box offers a modern twist on garden-themed invitations, so you can find invitations shaped like bouquets of flowers, garden lanterns, or a chic couple dressed in garden party attire as part of the invitation design. Paper Style: Paper Style sells invites with bright and bold color palettes. Invitations also have unique fold options, such as the gatefold, so that invitations open up in a similar style to a garden gate. The price range of the invitations depend on the quality of the paper or card stock and envelopes used to print the invitations. If you have your invites tailor-made or custom-made at a local stationery store, expect to pay more. Make sure you have viewed samples of what a particular printer offers, so you will be pleased with the final product and edit for typos and accuracy. Hosting a party with a garden theme is appropriate for almost any occasion. You can weave your love for gardening or the love of the great outdoors of the guest of honor into your them, which should also show in the party invitations you send to guests. You can allow your creativity to flow as you decide how to obtain or assemble your invitations.